IRVINE, CA--(Marketwire - January 18, 2011) - Roland DGA Corp. and MecSoft Corp. are teaming up at SolidWorks World 2011 to demonstrate a new design-to-part workflow for applications ranging from functional and snap-fit prototypes to nonferrous metal molds and biomedical solutions. The workflow combines VisualMILL for SolidWorks CAM software from MecSoft with Roland MDX milling machines, a powerful solution for producing parts and prototypes from a wide range of non-proprietary materials including aluminum, ABS, Acetal, Nylon, acrylic, polycarbonate, wood, plaster and polystyrene. "VisualMILL for SolidWorks is seamlessly integrated with our MDX series machines, making it easy for designers and engineers to go from SolidWorks to finished prototype," said Pedro Gonzalez, product manager for Roland. "The combined solution delivers smooth surface finishes, high repeat accuracies and tight tolerances to exact specifications." "Roland is a tremendous business partner that is truly committed to offering industry leading rapid prototyping and rapid manufacturing solutions," said Gerald Hiller, director of international sales for MecSoft. "Their MDX milling machines are based on 20 years of proven Roland Subtractive Rapid Prototyping (SRP) technology and offer several advantages over 3D printers." The Roland MDX line of 3D milling machines includes the MDX-540, MDX-40A and MDX-15/20, complete solutions including entry level CAM software for rapid prototyping and manufacturing applications. 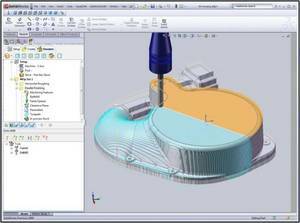 Adding VisualMILL for SolidWorks improves on MDX technology by facilitating more efficient machining strategies and higher throughput. For more information on Roland DGA products, please visit www.rolanddga.com. For information on Mecsoft products, visit www.mecsoft.com. About this company Roland DGA Corp.
Roland and MecSoft will demonstrate a new advanced Subtractive Rapid Prototyping workflow at SolidWorks World 2011 based on Roland MDX milling machines and VisualMILL for SolidWorks.